We were the recipients of the 2011 Mom’s Choice Award in the category of parenting and special needs. We work with you directly through interactive presentations. Our training sessions are 2 hours each. 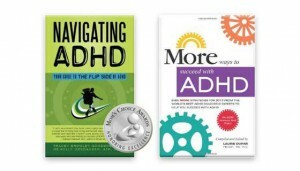 All of our trainings are based off our book, Navigating ADHD; Your Guide to the Flip Side of ADHD. 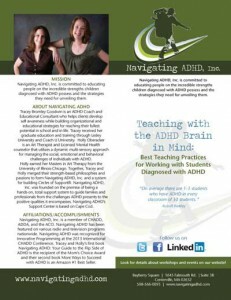 For Adults & Children—We provide a unique approach to train teachers in classroom strategies and ADHD awareness. We train on effective communication skills and the top 25 tips for classroom teachers. We offer 10 different trainings which include enhanced function skills, homework from assignment to completion, and boosting social skills.